With Dennis Claridge hobbled by a sprained ankle, sophomore Fred Duda got his first college quarterback start and guided Nebraska to a 28-6 victory over Kansas State. 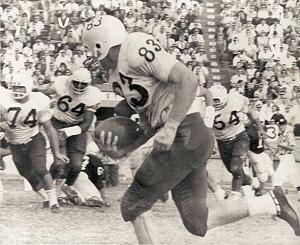 Husker defense played a large part in the win — center Ron Michka scoring on a 16-yard pass interception, and end Larry Tomlinson scoring on a 34-yard interception. Nebraska rushed for 352 yards and held the Wildcats, who relied mainly on a passing attack for their TD and 189 yards, to only 2 yards rushing.